Thomas Arthur Horne, known as Arthur, was born in Northampton in early 1881. His parents, Thomas and Ann, were both aged 42 when he was born, and he had at least six siblings: William born 1859, Mary Ann b1861, Sarah Elizabeth b1863, Maria b1866, Harriet b1874, and John b1878. His father had been a shoemaker in Moulton, Northamptonshire, but by 1881 he was a newsagent and the family appears to have been living above the shop. In the 1881 census, they were at 20 Mayorhold in Northampton. Young Thomas Arthur was there with his parents and siblings John, Harriet and Mary Ann, a domestic servant. Their neighbours were also tradesmen – a butcher, fishmonger, victualler, tailor and oilman – which suggests their newsagency was part of a parade of shops. Mayorhold exists today but is now home to a multi-storey car park. The family was still at Mayorhold for the 1891 census. By then Harriet was working in the boot and shoe trade, Maria was a mother’s help, John was a newsboy, presumably helping in the family business, ‘Arthur’, by then 10 years old, was still at school. (Note that Thomas Arthur was just called Arthur on the census, no doubt to distinguish him from his father.) There was also another child with the family, one-year-old William, described as Thomas and Ann’s son who, by then, were both 52. Arthur hasn’t yet been found on the 1901 census but it is thought he was working in service. In 1907 he married Louisa Bull from Badby, Northamptonshire. Their marriage certificate shows he was working as a domestic servant and resident in Preston, Lancashire. By 1911, Arthur, then 30, was a butler. He and Louisa were living in five rooms at 68 Lauderdale Street, Preston. The census recorded that they had been married for three years and had no children. Also with them were a niece, Emily Mary Bull, 7, and a boarder, James Leonard Lea, 35, an engineer’s clerk (electrical). 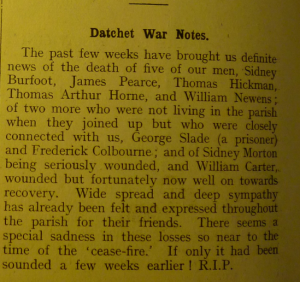 We don’t have a date for the Hornes’ arrival in Datchet. Mrs T A Horne was listed in Marshall’s Directory in 1916, at 11 Churchill Cottages, Penn Road. Thomas Arthur Horne was also on the Absent Voters List 1918 at 11 Penn Road. 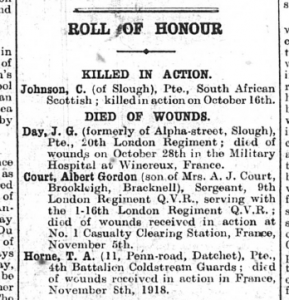 Arthur became Private 18423 in the 4th Battalion of the Coldstream Guards. His regimental number suggests he enlisted in Windsor in June or July 1916. According to the Forces War Records website, the 4th Battalion had formed at Windsor in 1915 as a Guards Pioneer Battalion and later became the 4th Battalion. They mobilised for war in summer 1915 and were deployed to France on 15 August 1915, joining the Guards Division. They were involved in various actions on the Western Front. 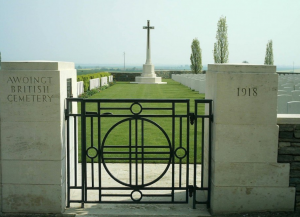 These included, after summer 1916, the battles of Flers-Courcelette, and Morval; in 1917, the German retreat to the Hindenburg Line, and the battles of Pilkem, Menin Road, Poelkapelle, Passchendaele and Cambrai; and in 1918, the Battles of St Quentin, Baupaume, Arras, Albert, Havrincourt, Canal du Nord, Cambrai, Selle and Sambre. They ended the war in France near Maubeuge. 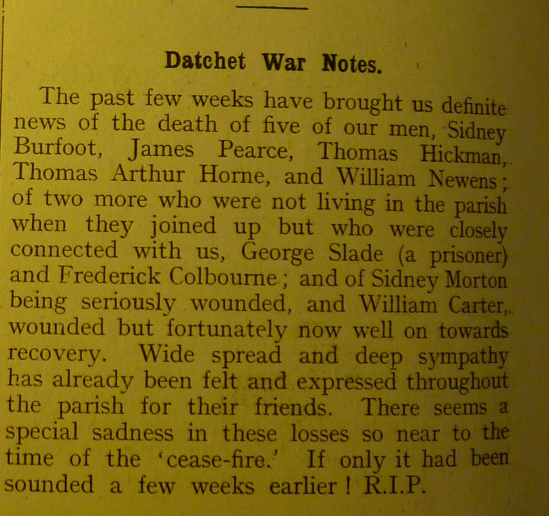 Just a few days before peace was declared, on 8 November 1918, Arthur died of his wounds at 38 Casualty Clearing Station (CCS), in northern France. The military records we have found do not indicate when he was injured. Casualties were generally moved as quickly as possible from the Clearing Stations to hospitals. Arthur might possibly have been injured a few days earlier during the Battle of the Sambre on 4 November. CCSs were usually located on or near railway lines to facilitate the movement of casualties from the battlefield to the hospitals. Although they were quite large, CCSs moved frequently, in the wake of German attacks and Allied advances. In November 1918, 38 CCS moved from Boiseleux au Mont to Denain. It was at one of these locations that Arthur died. 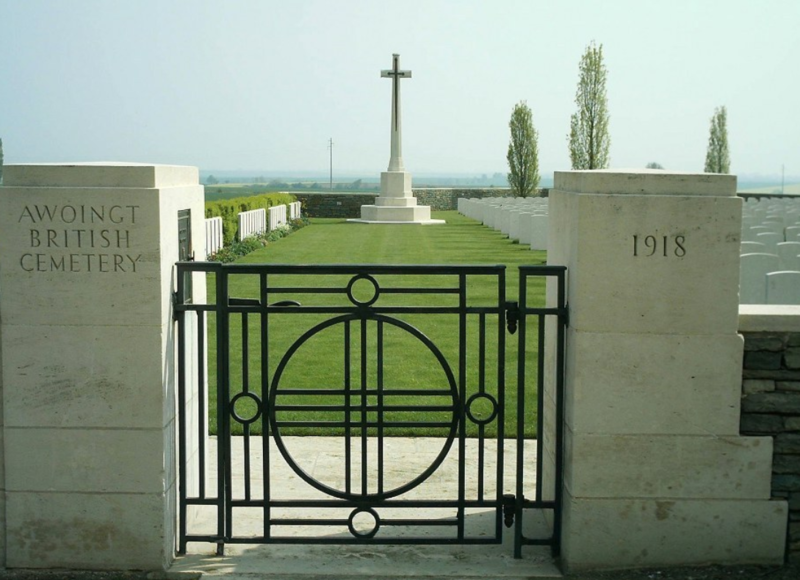 He was buried at Awoignt British Cemetery, France, in section 2, row G, grave 14.Arthur’s grave is to the right of the cross in this picture from the CWGC website. Thomas Arthur Horne was awarded the Victory and British War medals.